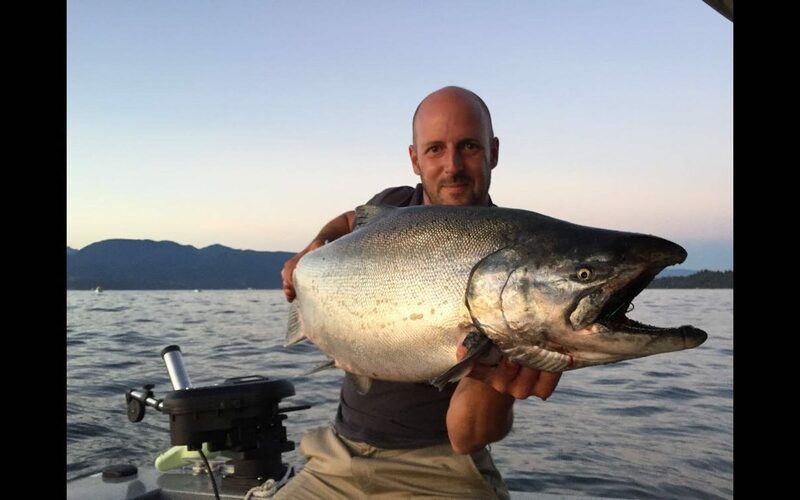 Mike Miller from Pier 73 Marina holding up a nice one that tipped the scales at 31.5 pounds! 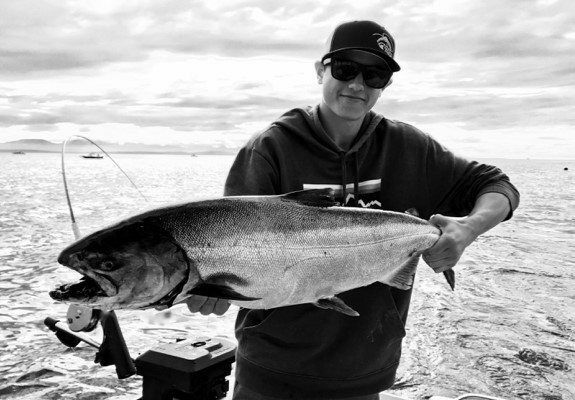 We had some classic late August chinook fishing this past week. Relatively calm seas, hot weather, and lots of red springs around. 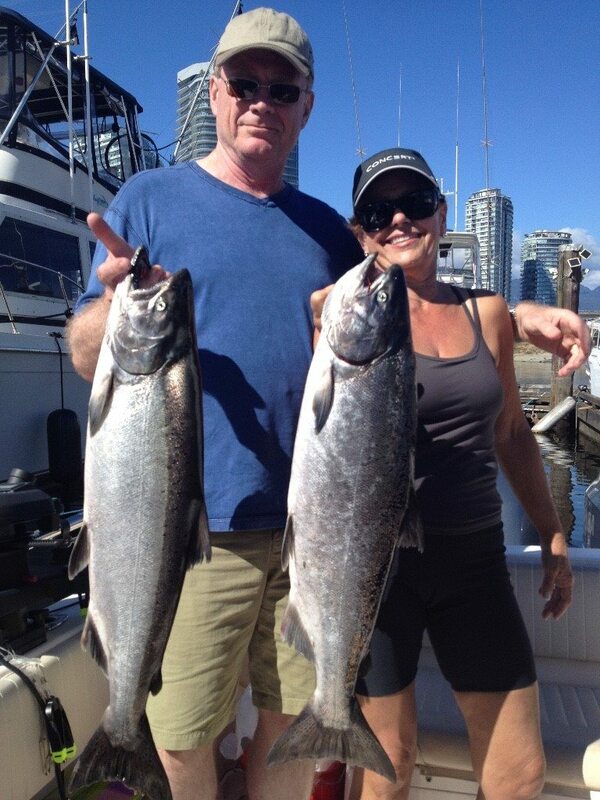 There were some pretty awesome catches of chinook from the South Arm, T 10, North Arm and the Bell Buoy. In particular there were some banner days early in the week at the Bell with Jason, Eddie, and Lars getting limits on their charters some days. As the week progressed it seems those fish moved on or went up the river and the action off the South Arm was more consistent. There was a pulse of fish off the North Arm on the Thursday evening flood though, so you never know. Keep in mind these fish are showing up on the tide, may or may not hang around for a few days, then they head up the river. So the fishing can change dramatically day to day and even tide to tide. Brendan with a beauty from the South Arm this week. The fish have been relatively shallow for the most part, 35-65 on the riggers has been hot. There were a few days when the fish were deeper, those with good electronics did see some down in the 90-120 range and adjusted depths and were paid with some nice fish in the boat. That being said, if you had to choose a 10 foot zone this past week you would have to pick 45-55 as most of the fish that hit our dock came from those numbers on the rigger. As usual, bait has been hot. We have been fishing about a 50/50 mix of anchovies and herring, in particular the smaller green and red sized herring that fit well into the anchovy classic teaser heads. For anchovies we have been using 5.25 and 5.5. Hot teaser heads have been the UV green versions on the top rods and glow green and glow chartreuse versions on the deeper rods. Productive flashers have been the Green Onion Glow, Club Dub Glow, Salty Dawg, Madi, Lemon Lime, and Chartreuse Glow. 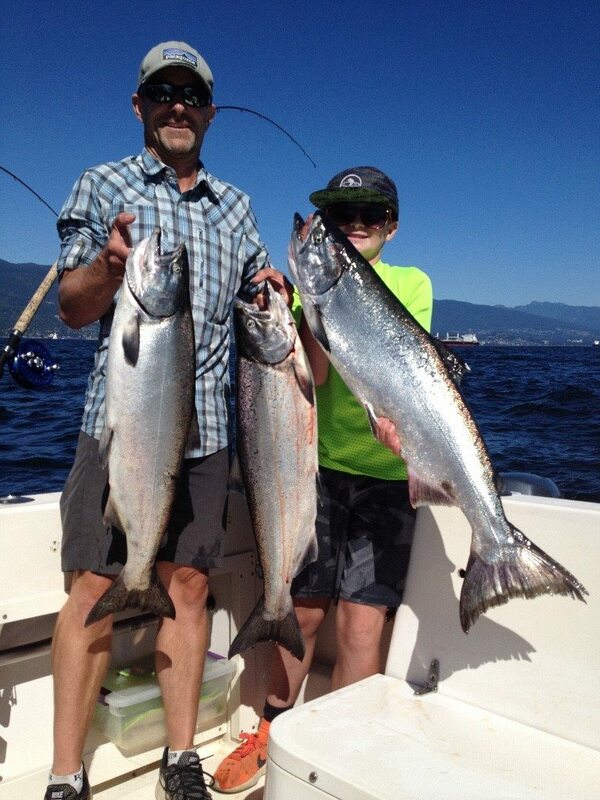 We have been laser focused on chinook this past week so we haven’t been chasing coho or pinks off West Van. I did take a few hours to sneak over to the Cap Mouth on one of the flood tides this week to do some prospecting. I didn’t hook or see any chinook on the sounder but we did pick up a nice hatchery coho, then we took off to the Bell because the bite was on. Traditionally the best place to catch the big whites is the South Arm, so if the winds allow, you may want to spend a little more time down there over the next 2-3 weeks. We will also get some of these fish off the Bell, usually the ones headed to the Cap. That’s about all we have to report at the moment, so make sure your gear is in perfect shape in case you hook a big white spring, and see you out there!